DC School Food Snapshot: Take a deeper dive into the landscape of DC School Food including our landmark legislation, The Healthy Schools Act! DCPS Local Wellness Policy: In 2004 the Child Nutrition and WIC Reauthorization Act said that all schools that participate in the National School Lunch Program are required to have a local school wellness policy that must be implemented by 2006. The USDA set forth this regulation to ensure that students’ health was prioritized on a district-wide level. Wellness policies are written by the school district. This link is highlighted and contains only the sections related to school food.Read the entire wellness policy here. Turning Points in School Food History: Since the creation of the National School Lunch Program in 1946, our school food programs have undergone a number of key transformations to get us to where we are today. Take a look at at some of these changes under different administrations over the years. 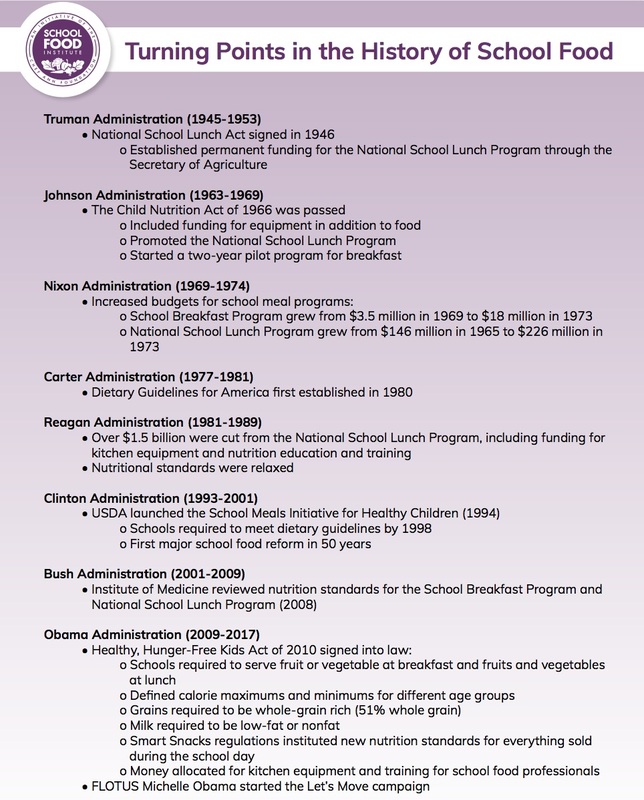 A Brief History of School Lunch in America Infographic: This is a useful infographic that also covers events leading up to the creation of the National School Lunch Program and beyond. Food In America’s Schools: How It Works and Why It Matters: National school meal program overview including regulations and current statistics. National School Breakfast and Lunch Program Meal Pattern: Overview of weekly breakfast and lunch nutrition guidelines. For a more in depth view into lunch and breakfast nutrition standards, click here. Cost of School Lunch: There’s just a dollar spent on food in the average school lunch. The other costs of running a food service operation – labor, mainly, plus equipment, supplies, maintenance, transportation, utilities, and more – bring the total to somewhere between two and three dollars. It’s important to learn about this stark financial reality for school food service directors in order to make informed recommendations about meal improvements.